There are two main ways to use origami in lessons. You can include origami as an enjoyable activity that helps to develop hand-eye coordination and attention to detail, encourages peer support and fosters relationship building. Or you can use it to support and enhance geometrical reasoning and mathematical learning (in addition to all of the above). I have to confess that I am no expert in using origami mathematically in lessons, having only done so a handful of times. However, in researching resources to share on this page, I have come across many activities that I am now very keen to try. I have put together a list of links with, where relevant, a short description or image of each activity. Do feedback if you try them out - I'd love to hear about it. The book Project Origami: Activities for Exploring Mathematics by Thomas Hull is an excellent compendium. Hull clearly details a range of origami-based, explorative, mathematical activities, with ideas for all age ranges. Each activity is accompanied by student handouts and includes a solution and pedagogy section. However there are also several free, high quality resources to be found on the web, a selection of which I outline below. This selection of paper folding activities from Nrich: Puzzling with Paper, Plaited Origami Polyhedra and a Plus Magazine article on The Power of Origami are well worth exploring and include many activities suitable for beginners or younger students. ​​The FMSP's Columbus Cube Challenge is a good test of teamwork, problem solving and accuracy. The Mathematical Origami page on the fabulous Mathigon website has a selection of polyhedra nets, as well as origami folding instructions for many interesting mathematical models. Paper Magic: Folding polygons from A-sized paper, a book by William Gibbs and Liz Meenan, is available via the National STEM Learning Centre. 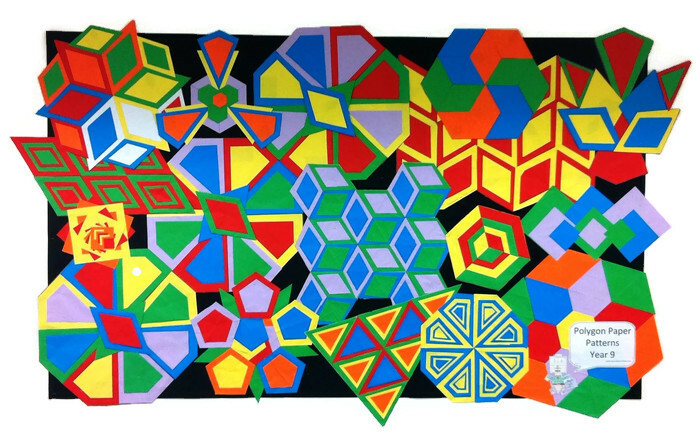 ​Another of Liz Meenan's publications, the Islamic Tilings and Polyhedra Teachers booklet (via the MA) contains her wonderful, geometric patterned, 'pop-up' nets. 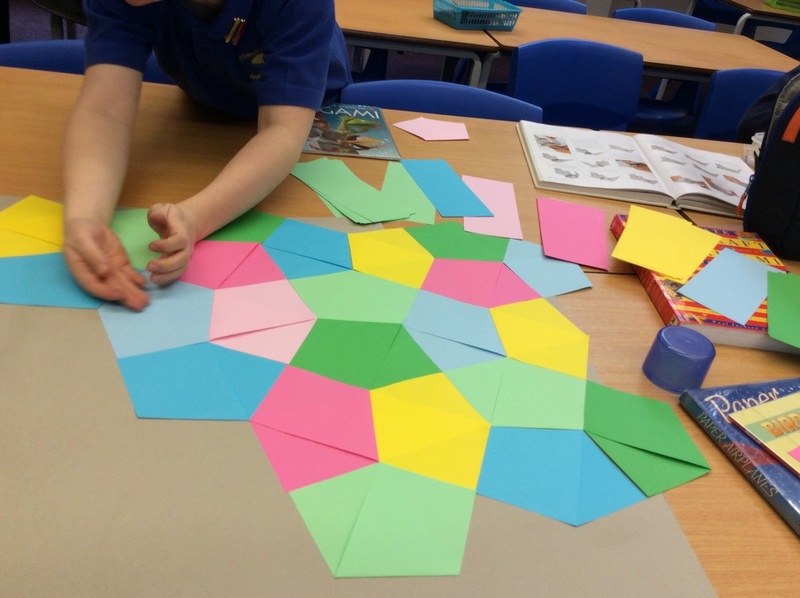 The mathematical origamist David Mitchell has a Mathematics section for teachers on his OrigamiHeaven website which includes instructions for folding tessellating paper tiles. And if you are keen to explore the construction of origami polyhedra then his book, Mathematical Origami, is highly recommended. Older students can be introduced to surds using A-sized paper. There are several freely available lesson ideas which follow a similar vein. For example, this problem from @the_chalkface, this one via Dave Gale (@reflectivemaths) and this puzzle from Matthew Scroggs (@mscroggs) are all based around folding an origami kite. This article from ATM London suggests some further ideas, including a lovely challenge investigating volume. Older students may also enjoy exploring the 7 Huzita–Hatori axioms of paper folding. Interestingly, there exist two more geometric constructions possible in paper folding than there are using compass and straightedge, one of which is the trisection of an angle. 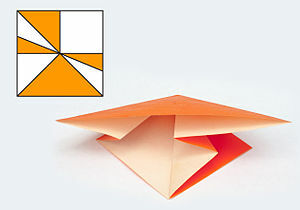 There are also two origami theorems to explore: Kawasaki's Theorem and Maekawa's Theorem, both of which involve the relationship between creases and angles in a flat origami model. And, why restrict yourselves to rectangular or square-based starting points?! There are some great activities out there based on folding circles (circular lab filter papers would be perfect for this). The NCTM has a lovely lesson exploring circle theorems that uses paper folding. And for younger students, this lesson from the Futures Channel on folding polygons from circles looks exciting. In addition, Wholemovement, an organisation solely dedicated to the folding of circles, explains how to fold four straightforward, but surprising, polyhedra models here. Finally, one for your further mathematicians: it is also possible to explore the conic sections through paper folding. This resource from MathinScience.info shows clearly how, as does this from Compass Learning. And Sarah Carter (@mathequalslove) has written an interesting blog post about the outcome of her wax paper parabola lesson. So, lots to explore! If you do try any of these activities out, I'd love to hear about your experiences. Perhaps use the hashtag #origamimaths if you post anything on social media. And if you have any more ideas or resources for using origami in lessons that you would be happy for me to share on this page, please do let me know.